This is a combo of 2 ebooks. Lucky Deck and Suit Order Systems Vol. 5 . 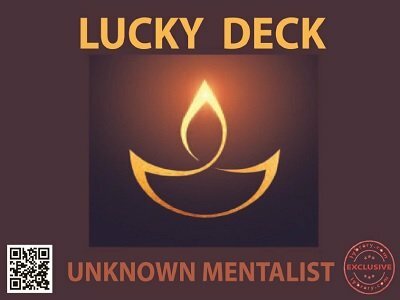 Lucky Deck is a very special stack. Because this arrangement of the deck can be used both as a memorized deck and/or as a cyclical stack. Both the values and suits look fairly random. Just by learning 3 simple and easy rules, you will be able to pick up the entire stack within no time. Probably by the time you finish reading this manuscript, you should be able to pick up this stack. Given any position, you will be able to name the card and vice versa. Also given any card, you will be able to get the next card as well. A very unique 'force' feature of the Lucky Deck will enable you to frame many interesting routines. Of course, a little practice will make you absolutely perfect. The Karma Deck which was released a couple of years back is based on a highly intuitive principle. Many stacks released subsequently like Sloka Deck , Monk Stack , Yogik Deck , Fun Stacks etc were based on different principles. But this Lucky Deck is based on robust logic but very easy to grasp and use. As a bonus, SOS Vol. 5 is included here, which explains 3 interesting methods for ordering suits for any stack. 1st edition 2018, 26 pages. I'm glad to see THE UNKNOWN MENTALIST back again. This is a very good deck stack that you will use or at least you will want this in your card stack library. By saying this I mean that I think those who know the KARMA deck stack and the SLOKA deck stack are spoiled with these particular deck stacks, I know I am. I can only say that those who enjoy deck stacks and THE UNKNOWN MENTALISTS' way of thinking will find this invaluable. I myself, will treasure this and I highly recommend this.